I am so ready for a straightforward crime/spy novel. This choice is thanks to 4_Mystery_Addicts reading group. Between Kristallnacht in late 1938 and the invasion of Poland in September of the next year the future of Europe became clearer – Hitler would lead the way into war. In Danzig (Gdansk) which was not a part of Germany until 1939, the Kindertransport arranged for Jewish children to be moved from Danzig to facilities in Britain. This is where the story opens when the protagonist, John Russell, a British journalist sees a train leave. One night a Russian approaches Russell about writing moderately positive articles about the Nazi regime in order for Stalin and Russia to approve a non-aggression pact (which they did in August of 1939). This proposal makes Russell a bit nervous – not too much distance between journalism and spying – but it’s good money and it’s not really objectionable at that point. Then he meets his neighbor, Tyler McKinley, an American journalist who has uncovered Hitler’s T4 plan, the euthanasia of the “incurably sick” Germans including children. And Russell becomes involved with helping a Jewish family in several dangerous ways. A murder does occur, but I’m not sure that’s the point of the story. 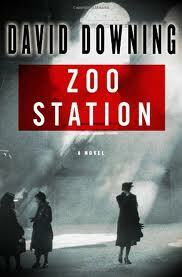 The spy novel really kicks in about 2/3rds of the way through – that’s well written, suspenseful, almost worth the ride.